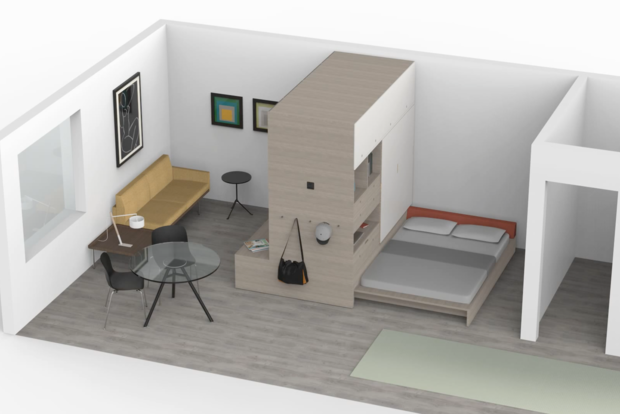 The company Ori recently brought robotic furniture to the MODE apartments in Logan Square. LOGAN SQUARE — Studio apartments in Logan Square just got bigger. The company Ori announced it is bringing robotic furniture to MODE, an upscale apartment complex at 1950 N. Campbell Ave. in Logan Square. The furniture can be controlled by a physical interface built into the furniture, a mobile app or through devices like Amazon's Alexa. The furniture allows residents to take a traditionally small area and maximize its capability. The bed can be hidden underneath the unit, the desk can be slid out, or the wardrobe opened all by the touch of a button. “With the push of a button, a studio apartment morphs from a large living area to a walk-in closet to a full bedroom,” said Jeffrey Hreben, development manager at Tandem Development. Ori — a spinoff company from MIT Media Lab CityHome project and designer Yves Béhar — collaborated to create the architectural robot unit in 2016. “The Ori Full and Ori Queen Systems will transform the experience of contemporary urban living. Ori Technology animates the furniture, walls and other parts of the living space in ways that maximize space, comfort and living," said Hasier Larrea, Ori CEO and founder. The furniture now is available in select cities including Boston, San Francisco, Miami, New York, and Washington, D.C.
Tandem Development, the developers for the MODE apartments, are one of 10 developers across the country to be chosen by Ori as part of a showcase program to preview trial units. “The Ori allows one to live in a 500-square-foot studio that functions as if it were a 750-square-foot one-bedroom,” Hreben said. The Ori system has only two requirements: a level floor and a standard electrical outlet. “Apartments like the MODE are ideal for the type of buildings we [Tandem] develop: smart, high-design apartments located near transit options,” Hreben said. As of now, the furniture is only available for trial in one studio in the MODE apartments. Ori plans more modifications to its original design to fit different room layouts. The furniture is available in a queen and full size. Ori is only allowing selling it to large scale real estate developers. When the complex opened earlier this year, published rents ranged from $1,750 for studios up to $3,695 for a large three-bedroom.